Researchers at Inserm and Paris Descartes University have just taken an important step in research on stem cells and dental repair. They have managed to isolate dental stem cell lines and to describe the natural mechanism by which they repair lesions in the teeth. This fundamental discovery will make it possible to initiate unprecedented therapeutic strategies to mobilise the resident dental stem cells and magnify their natural capacity for repair. These results are published in the journal Stem Cells. The tooth is a mineralised organ, implanted in the mouth by a root. 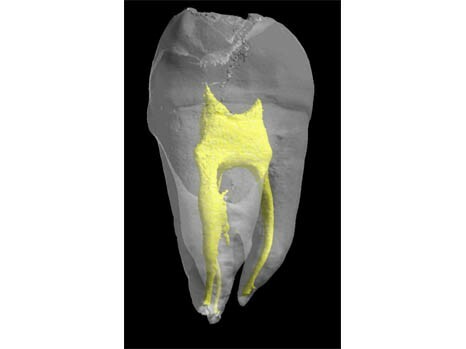 The “living” part of the tooth or dental cavity is the dental pulp (in yellow in the photograph shown opposite) composed of vessels and nerves. Around it is a hard substance, the dentine or ivory, which is in turn covered by an even harder tissue, the enamel. When a dental lesion appears, the dormant stem cells in the pulp awaken and try to repair the tooth by an unknown process. In this study, the researchers from Inserm and Paris Descartes University at Unit 1124, “Toxicology, Pharmacology and Cellular Signaling,” have succeeded in extracting and isolating tooth stem cells by working on the pulp from the mouse molar. The researchers were thus able to analyse the cells in detail, and identify 5 specific receptors for dopamine and serotonin on their surface, two neurotransmitters that are essential to the body (see schema on page 2). The presence of these receptors on the surface of these stem cells indicated that they had the ability to respond to the presence of dopamine and serotonin in the event of a lesion. 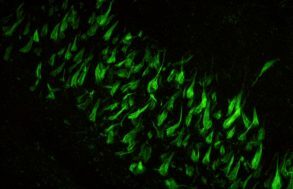 The researchers naturally wondered what cells might be the source of these neurotransmitters, a warning signal. It turns out that the blood platelets, activated by the dental lesion, are responsible for releasing a large quantity of serotonin and dopamine. Once released, these neurotransmitters then recruit the stem cells to repair the tooth by binding to their receptors (see schema on page 2). 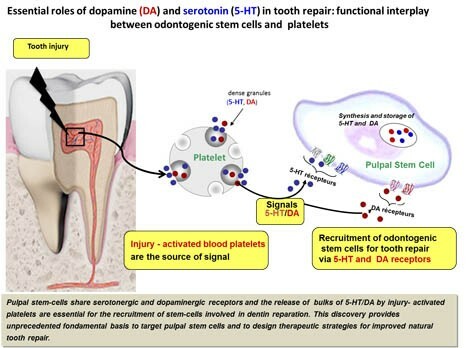 The research team was able to confirm this result by observing that dental repair was absent in rats with modified platelets that do not produce serotonin or dopamine, i.e. in the absence of the signal. “In stem cell research, it is unusual to be simultaneously able to isolate cell lines, identify the markers that allow them to be recognised (here the 5 receptors), discover the signal that recruits them (serotonin and dopamine), and discover the source of that signal (blood platelets). In this work, we have been able, unexpectedly, to explore the entire mechanism,” explains Odile Kellermann, leader of the team from Inserm and Paris Descartes University, and the main author of this work. To take things a stage further, the researchers tried to characterise the different receptors they found. One of the 5 receptors does not seem to affect the repair process. On the other hand, the other 4 turn out to be strongly involved in the repair process. In vivo blocking of just one of them is enough to prevent dental repair. 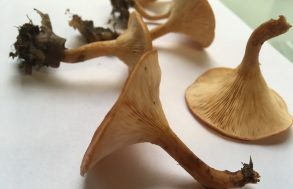 “Currently, dentists use pulp capping materials (calcium hydroxide) and tricalcium phosphate-based biomaterials to repair the tooth and fill lesions. Our results lead us to imagine unprecedented therapeutic strategies aimed at mobilising the resident pulpal stem cells in order to magnify the natural reparative capacity of teeth without use of replacement materials,” concludes Odile Kellermann. The foundations have been laid for extending this research done in rodents to stem cells of the human tooth in order to initiate new strategies for repairing teeth.